Though it has been declared extinct in Malaysia, we still have a chance on keeping the Sumatran rhino species alive. It has happened before; the hopes for the white rhino had vanished when the species suddenly resurrected; the famous Californian condor - who Jane Goodall likes to mention from time to time - made it despite there being only 22 remaining at the time; the Burmese roofed turtle has recently been declared "back from nearly-extinction" in Myanmar. And all these good news have happened thanks to the hard work and effort of conservationists. There is hope for the Sumatran rhino, but it will require a lot of work. And extra work. Even if poaching and habitat loss stopped, the survival of the species would not be guaranteed. 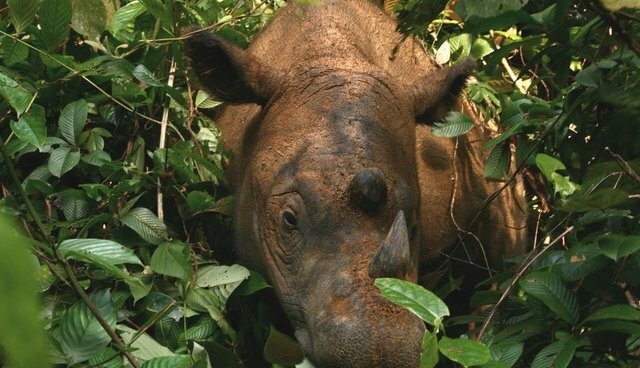 PhD student R. G. Havmøller says that, for their survival, it is completely vital that all remaining Sumatran rhinos are viewed "as a metapopulation, meaning that all are managed in a single program across national and international borders." Maximizing overall birth rate is a must. And so is learning from our mistakes. Conservationists are urging Indonesia to take note of what's happened in Malaysia and to intensify their efforts to protect their own remaining individuals. It looks like Indonesia has a big responsibility right now. Some say that creating intensive management zones could help increase protection against poaching. Others say that captive breeding is the solution. After all, as I've mentioned before, some species have resurrected thanks to zoos, like the Burnese roofed turtle. But not all species react the same to captive breeding. Rhinos, for example, have a rather disappointing background in the matter. What can be done, then? Ahmad Zafir, the author of the Oryx paper that announced Sumatran rhinos had been declared extinct, told conservation website Mongabay that putting together males and females in a semi-wild captive facility "would increase the likelihood of them mating," as well as minimize the risk of poaching. A semi-wild captivity means that a few rhinos would be captured and kept in enclosures within their habitat. Something like a national park. This way, the animals can be protected and monitored, whilst not being taken away of their native rainforest habitat. Lastly, for any solution to properly work, we should need the direct intervention of not only Indonesia's government, but of all governments with Sumatran-rhino-habitats in their countries. After all, political action is quicker and more effective than the work of a few conservationists. Laws and bans are needed to protect our wildlife around the world.